In addition, as one of the most rainy islands in Thailand, especially between June and October, the best time to visit is in what corresponds to the dry season, namely from November to May. By minivan, which in just the past few weeks no longer leave from Victory Monument but from the South station of Ekkamai. In 5 hours a minivan will bring you to the port of Trat, where you can catch a ferry for the island. The main convenience in using a minivan is in the flexible schedule. In fact there is one that leaves every half hour from 5 in the morning to 8 at night. By bus, which also departs from the South station of Ekkamai. Using a bus takes a little longer, up to even 7 hours, since they also make various stops for taking on local passengers. Moreover, there are only two buses a day which leave at 7:45 and 9:45 respectively. The cost of a bus ticket isn’t much different than that of a minivan, both will be around 350 THB. For minivans and buses, the best time to arrive at the port of Trat is around lunchtime when there are less people. If instead you’re thinking about leaving Bangkok in the late afternoon, remember that the last daily ferry for Koh Chang Island leaves at 19.30. Click here to read our guide on buses in Thailand. There is also the possibility of taking a plane from Bangkok’s international airport (Suvarnabhumi Airport) to Trat. Once you land you’ll still have to get to the port and take the ferry for 80 THB, which will take you to the island in about 40 minutes. The only company that offers this type of flight is Bangkok Airways; the flight takes only an hour but are rather expensive (they start at about 8,000 THB for a one-way ticket). Another problem that many have found with this route is that flights are often cancelled because the minimum number of passengers wasn’t met. Besides the buses and minivans that depart from the center of Bangkok, you can also reach Koh Chang by taking bus number 392 from Bangkok’s international airport. The stop is on the first floor of the airport, exit D.
This bus leaves at 7:50 in the morning, and a one-way ticket costs 600 THB, or 900 THB for a return trip. If your final destination is one of the beaches located on the southern side of the island, such as Lonely Beach, Kai Bae Beach, Bai Lan Beach, or Bang Bao Beach, then you can also take (again from the airport in Bangkok), a minivan that will bring you right to these beaches, depending on where you’ve booked your hotel. There are three daily departures: 9:30, 11:00, and 14:00. The cost for a round trip ticket, including the 80 THB for the ferry, is 900 THB per person. In the event that you want to travel in comfort, many taxis in Bangkok are willing to take you to Trat, for prices that start at 5,000 THB (a vehicle, not per person!) one way. Once you land on the island, if you’ve opted for a method of transportation that doesn’t include a transfer to the hotel, you’ll find local taxis that will take you directly to one of the beaches where you’re staying for prices that can vary greatly depending on where your hotel is, so it would be a good idea to negotiate! Other than from the capital, you can also get to Koh Chang coming from other places. The closest is Pattaya, which is about 4 hours from the port of Trat. From Pattaya four minivans leave each day, and all offer a direct ride to the island’s main beach, White Sand. The cost for this services is 600 THB a person. There are no other direct connections to Koh Chang. If you’re in another city, to reach Koh Chang you’ll first have to go to Pattaya or Bangkok by train, bus, minivan or internal flight. Since it’s an island, obviously prices are higher than on the mainland. There are however different price ranges depending on the hotel, and time of year. Lonely Beach is definitely the most popular for young tourists, where it is possible to rent a bungalow for just 7 USD a night. Even around White Sand Beach you can find different types of lodging, from cheap Guest Houses to hotels with a pool (which can also cost 50 USD a night, in low season). 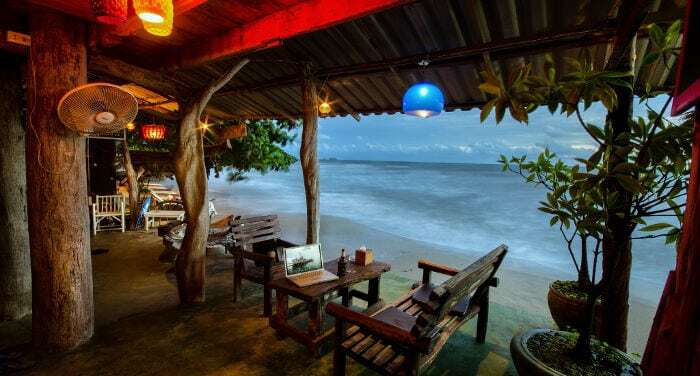 Click here to find a hotel (or hostel) on Koh Chang. There are various villages on the island, almost all facing one of the beaches, which in total are a little less than a dozen. The most famous is White Sand Beach, a beach with white sand that extends for about two kilometers. Both during the day and when the sun goes down, at White Sand you can taste local foods and international dishes thanks to a discreet variety of restaurants in this part of the island. The closer you get to the southern part of the island, the more peaceful and family friendly the beaches become, and also suited for those who want to relax completely. One example is the southernmost beach on the island: Khong Koi Beach. This area is very relaxing; the beach is sandy and there’s the possibility to rent a canoe and explore the area. The only “flaw” is that it’s so far from the port; therefore taking a taxi takes about 50 minutes. And since this is a very quiet area, night clubs are practically non-existent. If instead your objective is to enjoy yourself, meet other tourists, and/or not spend much, then Lonely Beach is the one for you. Like White Sand, this beach is also pretty big, about 1 kilometer long, and is considered the place for partying. The various clubs, whether on the beach or not start opening at drinking hour and go on deep into the night. If this is the type of vacation you’re looking for, then rent a room near this beach. If instead you’re looking to stay in a quieter place but still want to spend a few nights at Lonely Beach, you can rent a scooter for 300 THB a day, or take a taxi, with whom you can negotiate a price. The average cost for a ride is about 250 THB a person, starting from White Sand Beach, which is about a half hour away. The main activities on Koh Chang are mainly centered around nature. The most popular are scuba diving, and for those who only want to use a mask and tube, snorkeling. Tours leave in the early morning and end at around 17. Since all boats leave from the port at the southern end of the island, a minivan will get you at your hotel, which will take you to the port. Tours on the big boat cost about 1,300 THB a person, but if you’d rather have a personalized experience and go with speedboats, the cost can go up to around 1,800 THB a person. These prices include a visit to the small islands around Koh Chang, lunch on the boat, and rental snorkeling equipment (except for find which you’ll have to rent separately). Prices for diving are much higher; they start at a minimum of 3,500 THB and go to a maximum of 50,000 THB, for those interested in getting their license to teach others how to dive. The most famous schools on the island are often run by foreigners. One example is Scandinavian Chang Diving Center, where, if English isn’t your strength they speak other European languages and you can dive with instructors that speak German or French. The schools are mainly found on White Sand Beach, or directly at the port of Bang Bao. Both for diving and snorkeling, before getting on board you’ll be asked to pay 200 THB for an entrance ticket to the national park where they carry out these activities (only if you’re a foreigner, for Thais it’s free). Other than diving and snorkeling, on Koh Chang you can visit the waterfalls of Klong Plu (2 kilometers from Klong Prao Bay), Klong Nueng (the highest waterfall on Koh Chang, located near the village of Salak Phet), Klong Jao Leuam (5 kilometers from Klong Son Bay, on the north part of the island), Khiri Phet (2 kilometers from the village of Salak Phet, in the southeast of the island), Klong Nonsi (towards the north, 3 kilometers from the village of Dan Mai), or Than Mayom, the most famous waterfall on the island, with four levels where you can also take a dip. The entrance fee for each waterfall is 200 THB a person, plus a parking fee of 10 THB. The most convenient way for reaching the scattered waterfalls around the island is by scooter. Many hotels also make bicycles available; but keep in mind that the roads at a certain point reach a very steep incline, especially near the highest point of the island (Kai Bae), situated between Kai Bae Beach and Lonely Beach. As in all Thailand, even in Koh Chang there are cooking schools for learning how to prepare typical local dishes. Unlike in the capital, where prices hover around 1,500 THB for three hours of instruction, on Koh Chang schools offer courses starting at 1,000 THB.